Adnexal torsion is an unusual cause of acute abdominal pain during pregnancy. Here we report a rare case of adnexal torsion in pregnancy. A 30 year old Gravida 3 para 2 living 2 with 10 weeks of pregnancy presented with severe abdominal pain and vomiting. Right abdominal tenderness was detected. On pelvic examination bilateral forniceal fullness and tenderness was found. Transabdominal ultrasound scan and Doppler reported right adnexal torsion with hemoperitoneum with multiple simple cysts in left ovary. 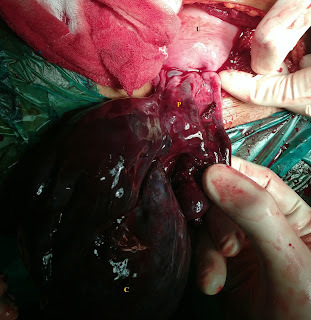 Emergency exploratory laparotomy, right salpingo-oophorectomy and left ovarian cysts enucleation with left ovarian reconstruction was performed. A 30 year old Gravida 3 para 2 living 2 with 10 weeks of amenorrhea came with a new onset of severe abdominal pain, nausea and vomiting (1 episode, containing food material, non-projectile) for one day. She described the pain as sharp non-radiating type, more in the right iliac fossa with a sudden onset, and with no relieving factors. Abdominal pain was not relived with analgesics. She gave no history of vaginal bleeding or discharge. There was no history of fever, diarrhea, constipation, urinary complaints or any recent illness. No history of any risk factors for adnexal torsion such as ovarian hyperstimulation, ovarian cysts, and previous history of torsion. On general examination, she was conscious, with pulse rate of 96/ minute, temperature of 37.4 °C, blood pressure of 110/70 mm of Hg, cardiovascular and respiratory systems were normal, but pallor was present. On abdominal examination tenderness was elicited in the right illiac fossa, and a 24 week size mass was palpable in the right iliac fossa which was firm in consistency. There were no signs of peritoneal irritation. On pelvic examination there was no vaginal discharge, uterus was soft, 12 week in size, os was closed, no cervical motion tenderness could be elicited, bilateral forniceal were full and tender. In her blood investigations Hb was 7.7 gm%, WBC count was 26,300/ mm3 and platelet count was 3 lakh/ mm3. Coagulation profile was normal. Tumor marker’s were within normal limits. One unit of packed cells was transfused, parenteral antibiotics and analgesics were administered. Transabdominal sonography and Doppler visualized a single live intrauterine gestation with a gestational age of 11 weeks 1 day. Right ovary showed 13×9×11 cm with multiple peripherally arranged hemorrhagic follicles with echogenic central stroma, absent vascularity and evidence of twist anteriorly towards the left and the umbilicus, suggestive of right ovarian torsion. A bulky left ovary of size 7×4.4×8 cm with multiple simple cysts with maintained vascular stroma was seen. Mild hemoperitoneum was also seen. She and her relatives were counseled concerning the risk of abortion and the possibility of adnexal torsion, and informed consent for abdominal exploration with the possible need for salpingo-oophorectomy was obtained. An emergency exploratory laparotomy under general anesthesia through midline vertical infraumblical incision was performed, demonstrating an enlarged, 15×15 cm, hemorrhagic, irregular, ruptured, gangrenous right ovary and lateral 2/3rd of right fallopian tube, twisted twice at the infundibulo-pelvic ligament. (Figure 1s). Hemoperitoneum of around 250 cc and clots of around 50 gm were present. Left ovary was bulky and showed multiple simple cysts with maintained vascularity. Detorsion was carefully performed, but no improvement in color or decrease in edema was noted even after 20 minutes. A right salpingo-oophorectomy was then performed. Some left ovarian cysts were aspirated and some were enucleated and left ovarian reconstruction was done. Left fallopian tube was normal. 1 unit blood was transfused postoperatively. Injection depot hydroxyprogesterone caproate was given. Parenteral antibiotics were continued. The postoperative course was uneventful, and a live intrauterine pregnancy was confirmed after 3 days, postoperatively. She was discharged on day 5 with Hb of 9.6 gm% and WBC count of 9300/ mm3.The histopathology report was suggestive of hemorrhagic infarct secondary to torsion of right ovary, right tube was markedly congested. Figure 1. 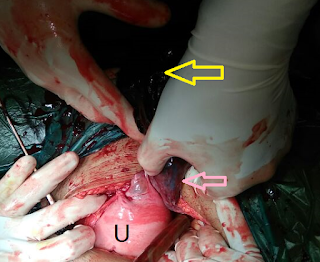 Intraoperative finding showing Gravid uterus (U), pedicle of the ovarian cyst (pink arrow), ovarian cyst (yellow arrow). Figure 2. 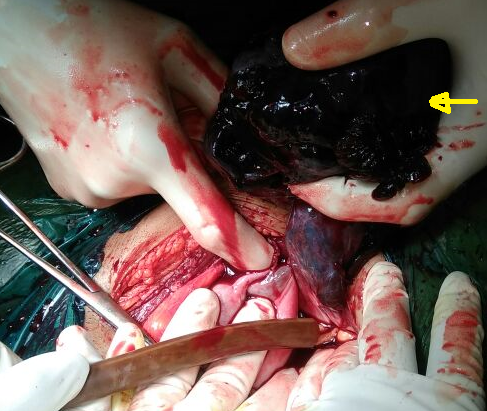 Ruptured Ovarian cyst showing blood clot (yellow arrow). Ovarian torsion in pregnancy is a rare condition. Diagnosis depends on clinical presentation and ultrasound evidence of an enlarged adnexal mass. Surgery when required, can be approached either laparoscopically or by laparotomy. Smorgick N, Maymon R, Mendelovic S, Herman A, Pansky M. Torsion of normal adnexa in postmenarcheal women: can ultrasound indicate an ischemic process? Ultrasound Obstet Gynecol. 2008;31(3):338-41. Kemmann E, Ghazi DM, Corsan GH. Adnexal torsion in menotropin-induced pregnancies. Obstet Gynecol. 1990;76:403-406. Chambers JT, Thiagarajah S, Kitchin JD 3rd. Torsion of the normal fallopian tube in pregnancy. Obstet Gynecol. 1979;54(4):487-489. Hibbard LT. Adnexal torsion. Am J Obstet Gynecol. 1985;152(4):456-461. Pan H-S, Huang L-W, Lee C-Y, Hwang J-L, Chang J-Z. Ovarian pregnancy torsion. Archives of Gynecology and Obstetrics. 2004; 270(2):119–121. Oelsner G, Cohen SB, Soriano D, Admon D, Mashiach S, Carp H. Minimal surgery for the twisted ischaemic adnexa can preserve ovarian function. Hum Reprod.2003;18:2599-2602. Lee CH, Raman S, Sivanesaratnam V. Torsion of ovarian tumors: a clinicopathological study. Int J Gynaecol Obstet. 1989;28(1):21-5. Chapron C, Capella-Allouc S, Dubuisson JB. Treatment of adnexal torsion using operative laparoscopy. Hum Reprod. 1996;11(5):998-1003. Cohen SB, Oelsner G, Seidman DS, Admon D, Mashiach S, Goldenberg M. Laparoscopic detorsion allows sparing of the twisted ischemic adnexa. The Journal of Minimally Invasive Gynecology. 1999;6(2):139-143.